Confronting the Crisis in Nutrition. The Office of Research Integrity Conference on Quest for Research Excellence. The Office of Research Integrity is hosting a conference on the Quest for Research Excellence and, for the first time, there is session that directly confronts policy and The Crises in Nutrition. The Speakers will delineate the problem — the two worlds of establishment nutrition and the major challenge of low carbohydrate diets, the growing problems of childhood obesity and our failure to deal with it, the confusion in the popular press on scientific issues, and finally, the voice of the patient, the failure to listen to the people who are dissatisfied with official guidelines and who have found workable solutions themselves. Three specific goals are recommended: 1) open hearings in which all researchers are represented, 2) funding research in which all people in low carbohydrate research work with others and finally, 3) a new oversight agency from NSF or Office of Research and Technology Policy. The three goals may be a useful crystallizing point for moving forward. What can you do? Contact your elected officials and copy one of the authors from the conference. Use the Abstracts below as a basis for your own version of what needs to be done. The three goals can be more narrowly focussed for your own interests. Encourage local media to cover the meeting. Information is at http://ori.hhs.gov and the speakers can be contacted directly. Publicize your version of the three goals on your blog, your facebook page or other social media. Quest for Research Excellence, March 15, 2012. Session on Crisis in Nutrition. The interest in nutrition for general health and for the prevention and treatment of disease is probably greater than at any time in history. A fairly large research community has grown up to provide information on the subject but the excellence of the results and their ability to inform the general public is highly questionable. The prospect for the future quality of research is similarly discouraging. This session focusses on a crisis in nutrition: the confusion in the public’s mind and the lack of accountability of official agencies and their failure to consider minority points of view. Four areas are considered in this session: the need to consider work that has been done on carbohydrate restriction (the major alternative to current recommendations), the limitations of current media representations of research, the problem of childhood obesity, and finally, the failure to listen to the patients who have not been well served by current ideas and who have discovered alternatives for themselves. The public, athrough forums and comments to blogs and other social media, have expressed substantial dissatisfaction with the current state of medical nutrition. First, we need hearings to be held by congress or HHS in which all major researchers in nutrition are represented. We have to have everybody in the game. The USDA guidelines committee, the American Health Association nutrition panels have to meet with their critics. In particular, researchers in dietary carbohydrate restriction should be able to meet and discuss issues with their critics. This is what the government can do. Better than taxation or other punitive measures, they can bring out the information. The NIH or congress should hold meaningful hearings where all sides are heard. Second, we need to fund a study in which researchers in dietary carbohydrate restriction and critics of such diets cooperate to design a long-term comparison of CRD and low-fat diets, Mediterranean diets or whatever. The groups agree on methods of procedure, make-up of the diets, how compliance will be effected, and what parameters will be measured. They “write the paper first, leaving room for the data,” that is, they agree in advance on what the possible outcomes are and what conclusions could be drawn from them. In this way, the public and other scientists will have a sense that the issues have adequately been addressed and the results reliably evaluated. Finally, what’s needed is the creation of a new oversight organization, possibly under the auspices of the National Science Foundation or the Office of Science and Technology Policy in which scientists with no personal stake in nutrition, assess bias in grant awards and publications. The scientific principles involved in nutrition are neither so technical nor so profound that accomplished scientists from other fields cannot evaluate them. Such organizations might make recommendations (or indicate the limitations in existing knowledge that prevent making recommendations) after hearing all credentialed experts. In the end, we have to say whether there is really a problem or not. Is their really an epidemic of obesity and overweight? Is there a crisis in the incidence of diabetes, or not? Are our health problems, the rising cost, the patient suffering, real? If they’re real, we have to use everything we have. We have to have real science and we can’t continue with one expert committee after another making recommendations but taking no responsibility for outcomes and refusing to show any willingness to confront their critics. Crisis in nutrition: I. Research Integrity and the Challenge of Carbohydrate Restriction. Objective: Research integrity extends beyond falsification of data and explicit misconduct. We assessed the extent to which established majority opinion recommending dietary fat and saturated fat reduction has failed to cite contradictory evidence, accepted undocumented conclusions and marginalized contributions of alternative points of view, specifically the role of dietary carbohydrate restriction, the major challenge to current recommendations..
Main points: Government and private health agencies have long recommended a reduction in dietary fat, particularly saturated fat, in the treatment or prevention of cardiovascular disease, obesity and diabetes. While there are many disclaimers, low-fat in some form remains the standard nutritional recommendation. Alternative strategies based on control of insulin fluctuations via carbohydrate restriction, while widely used by many in the community, have been discouraged if not actually attacked. This has contributed to a “two worlds” system that has increased confusion among scientists and the public. While there are many exceptions and some emerging acceptance of carbohydrate restriction — which frequently fails to cite earlier work — there is a perception of a majority opinion with pervasive control of the scientific infrastructure: editorial boards, study sections and health agency administration. Examples will be given of undocumented negative statements about low-carbohydrate diets, misrepresentation of data and extensive failure to cite relevant papers from the literature. Most troubling is the tendency to accept some of the conclusions previously demonstrated in low-carbohydrate research without, again, giving appropriate citations to that research. This has led a significant part of the population to distrust official recommendations and medical science. There is a need to re-evaluate published data on carbohydrate restriction and to guarantee adequate peer review of future manuscripts and grant applications on macronutrient composition of the diet. More generally, better communication and cooperation between researchers and physicians with different opinions can only benefit science and society, a society that is admittedly not making good progress on obesity, diabetes and metabolic syndrome. Figure 1. 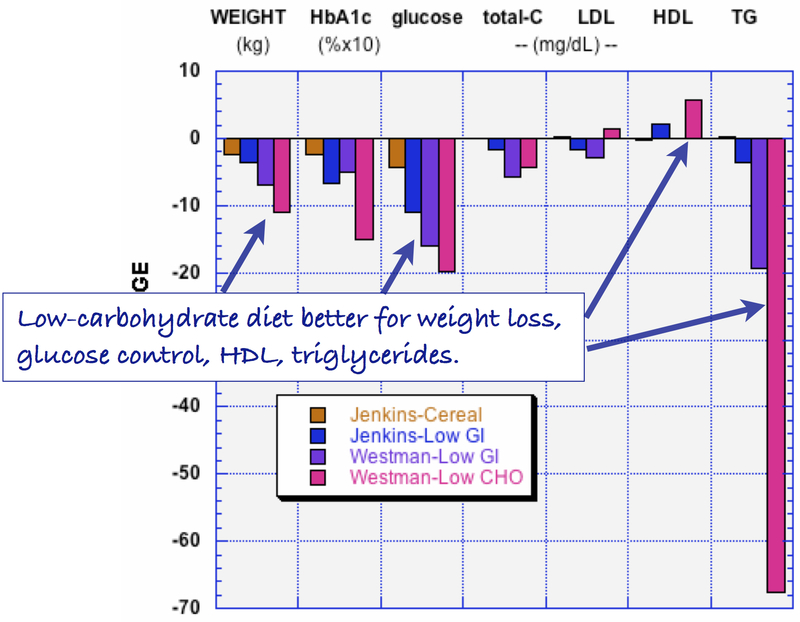 Comparison of low-carbohydrate diets to low-GI diets and high cereal diets. Objective: The public relies on popular media for description of nutrition research. A major interest is the controversy over macronutrient composition of the diet and particularly the role carbohydrate-restriction, the major challenge to official recommendations. The goal is to assess the extent to which statements to the media and especially press releases from authors, author institutions and journals accurately represent the results of reported research. To determine the extent to which personal bias influences and is taken as fact by the media. Main points: Authors of research papers should sensibly have great freedom in describing the implications of their research to the media, but it is important that the public be aware of when that opinion does or does not follow directly from the publication. Two examples are given. In one, an animal study (Foo, et al. Proc Natl Acad Sci USA 2009, 106: 15418-15423), the accompanying press release implied that it was motivated by observations of patients in a hospital which were not described, were unsubstantiated and would have been purely anecdotal. In a second example, a press release stated that carbohydrate-restricted diets (CRDs) were not included in a comparative study because of their low compliance (Sacks, et al. N Engl J Med 2009, 360: 859-873. No data were given to support this assertion and it is, in fact not true — CRDs have, on average, better compliance than other dietary interventions. The study concluded that the macronutrient composition of the diet was not important even though, as implemented, dietary intake was the same for the groups studied and, again, the CRD was not included in the study. It seems likely that that this would have an inhibiting effect on the willingness of individuals to choose a CRD, an outcome that was not justified by the published research. Conclusions & recommendations: Practices should be evaluated and guidelines should be generated by academic societies, scientific journals and the popular media as to what constitutes appropriate press description of published research. Reasonable principle are that only those specific conclusions that derive directly from the publication. The generally accepted idea that authors make clear what is their personal opinion and what is the product of research should be the norm. Biography: Richard David Feinman, PhD in Chemistry (University of Oregon) is Professor of Cell Biology at SUNY Downstate Medical Center. His current area of research is nutritional biochemistry and biochemical education especially as it relates to macronutrients and bioenergetics. He is founder of the Nutrition & Metabolism Society and former co-editor-in-chief of the journal Nutrition & Metabolism. Figure 2. The world according to Reuters. Low-fat is good. It’s bad. It’s not as bad as we thought. Wait! Eat more fruits and vegetables. “The low-dat diet craze?” Is that what it’s been? Is? Author: Wendy Knapp Pogozelski, Dept of Chemistry, SUNY Geneseo, Geneseo, NY 14454. Objective: Almost one-third of American children aged 2-11 qualify as obese or overweight, with obesity-related diseases such as type 2 diabetes greatly on the rise in this population. Despite the labeling of the crisis as “epidemic,” funding to study childhood obesity has been limited and restricted to the traditional intervention strategies (to reduce calories, to reduce dietary fat and to exercise more) despite the fact that these efforts have been largely unsuccessful. The time has come for frank assessment of foundational beliefs about a) the causes of obesity in children and b) effective prevention and intervention strategies. This talk will discuss assumptions that are barriers to research and will compare results from traditional calorie-restriction programs with results from programs that have emphasized carbohydrate control and insulin reduction. Conclusions & recommendations: The crisis warrants policy change. 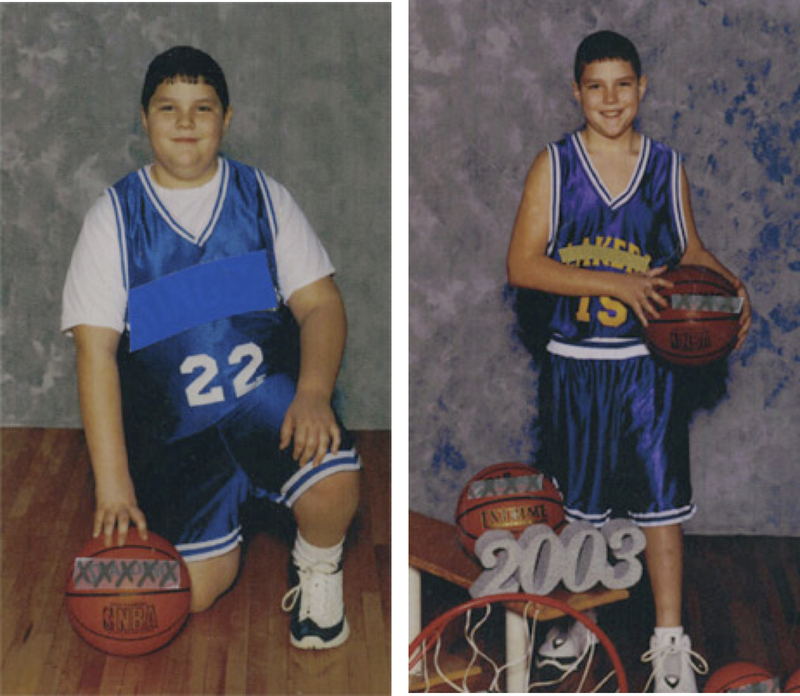 1) Funding for childhood obesity should be increased. 2) A broader range of methods and principal investigators should be instituted, with greater accountability required of funded investigators. 3) The USDA nutritional recommendations, a “one size fits all” guide for school meal programs should be reevaluated and reformulated to take into account all strategies for obesity prevention and intervention. 4) Education for physicians, dietitians and health care professionals, as well as the general public, should be altered to include an understanding of the most positive results in obesity prevention. Biography: Wendy Pogozelski, PhD in Chemistry (Johns Hopkins University) is Professor of Chemistry at SUNY Geneseo. Her research has been in radiation effects, DNA damage, and DNA computing. Current efforts are directed toward biochemical-based nutrition education for health professionals, educators and the general public. In addition to developing teaching materials that incorporate nutrition research, Dr. Pogozelski writes and lectures on diabetes and works with local and national organizations to improve nutrition education. Objective: Blogs and other social media provide insights into how the public views the current state of nutrition science and the official dietary recommendations. We ask what can be learned from online discussions among people who dispute and distrust the official recommendations. Conclusions & recommendations: Our findings document a large number of such cases pointing to the need for public hearings and or conference. The community is not well served by an establishment that refuses to address its critics from within the general population as well as health professionals. Figure 4. Some comments from the Active Low-Carber Forums (140, 660 members on March 12, 2012). Tom Naughton is a former writer for a health magazine, a contributor to the Encylopedia Britannica’s Health and Medical Annual, a documentary filmmaker, and popular blogger who specializes in health and nutrition issues. Jimmy Moore’s top-rated “Livin’ La Vida Low-Carb” blog has drawn more than 6 million visitors since 2005. His podcast show, “The Livin’ La Vida Low-Carb Show with Jimmy Moore” has featured interviews with hundreds of respected doctors and researcher. He has also authored two books. Laura Dolson, MS is a writer and cancer support provider at Mediconsult.com, and hastaught health and nutrition classes at a junior high charter school in California. Her About.com nutrition website draws hundreds of thousands of visitors monthly. There’s more to it than who gets the grants. Corporate fingers run through every aspect of governance, creating a favorable environment for profitability. Do you know about Order 81? Can anyone offer a reason why Iraqi farmers should be *required* to use seeds provided by Monsanto or other GMO companies? A reason, that is, that involves benefit to anyone besides Monsanto? If they go to these lengths to make sure their subsidized products get sold to us, you can bet they also have plenty of influence in nutritional research. Look at the outcry when Michelle Obama tried to advise less sugar, or when the soda tax was floated. Look what happened when the government tried to reduce the french fry servings in school lunches. I think this needs to be addressed as much as scientific integrity, but it’ll be a lot tougher nut to crack. Another good vox populi resource is the comments threads on Youtube clips of Gary Taubes, or anyone else with a media profile, speaking about low-carb. This probably catches the opinions of some who wouldn’t post on low-carb forums. 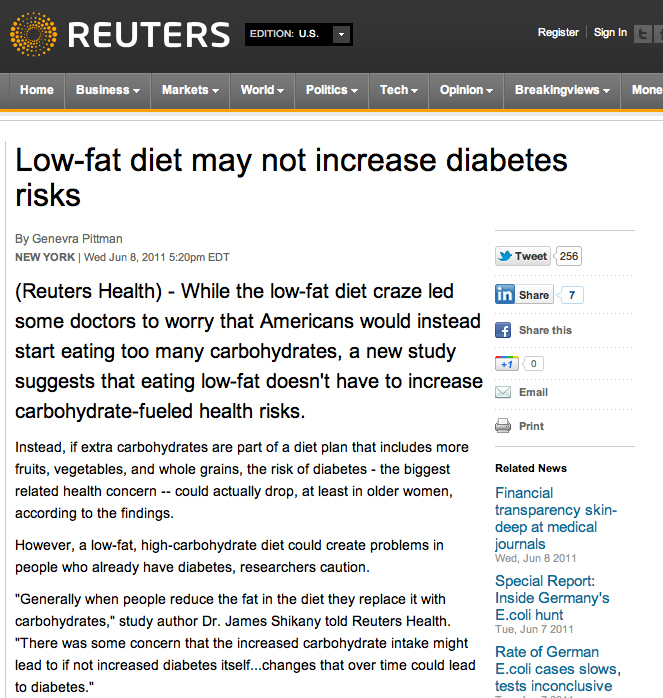 The Reuters article is great, as today’s diet craze is tomorrow’s fad diet. Ridiculous as it is, it could be the first sign that the tide is turning. Ridiculous, because it’s saying that it’s OK to eat lots of carbs, as long as they’re full of so many antinutrients that your ability to use them as carbs is sufficently impaired. Leaf- and fruit-eating insects are high-carb feeders, and polyphenols inhibit growth by restricting carb utilisation. This is why polyphenols like resveratrol (which is not unique) are said to “mimic calorie restriction”. far more effective intervention than restricting salt. offered as an alternative to the failures of the phony war on food. Can I interest anyone in an unused analogy? The old calories in – calories out model used a steam engine analogy when it came in, back in the 19th century. The current model is like a hybrid car. You can run it on petrol (carbs) but most of this will go to top up the battery (fats) which are what the car runs on most of the time between gas stations. Or you can refill the car just by charging the battery from a mains power source (high fat diet). You need a little gas in the reserve tank (glycogen) to start the engine, but you could always get out and push (ketone bodies). In doing so, you might burn off some energy yourself (metabolic advantage). Thank you. For more on steam engines and calories, you can check out my YouTube http://bit.ly/RZ4v that explains thermodynamics in a few minutes. I think it’s awesome that you are doing this and you have smart, talented help. Hope the authorities listen. I think they tend to listen if many people tell them. We proposed three clear, reasonable approaches. YOu can bring it to your elected officials. Let us know what they say. I just watched Naughton’s presentation on Utube. What a fabulous presentation of the idiocy of our present ‘experts.’ Wish I could get my fellow dietitians to listen to it. They would understand why they are losing all credibility. We look forward to your report on your fellow dietitians. Is there a report anywhere on how the conference went? Who attended? How they responded? The conference was, on the face of it, disappointing in that very few people came to our session. They scheduled many simultaneous sessions and the conference seems to have been about theory of research integrity and other topics way off to the side of practical science, not to say nutrition. I was not as disappointed as Tom Naughton whose compelling presentation is on his blog at http://www.fathead-movie.com/index.php/2012/03/19/the-ori-speech/. He came last by which time the already small attendance had dwindled down to single digits. A couple of attendees were important and follow up may pay off but, most of all, we are on the radar at ORI. The excesses in the nutrition world are marginally violations of research integrity although I think a couple cross the line and it remains to be seen if I or others will actually file a complaint with them. ORI had said that they were going to videotape the presentations but didn’t and I will produce my presentations for the blog and/or YouTube and the issues are still there and we will press forward. The bottom line is that the arrow that the lipophobes shot into the air has not yet hit the ground. Tom Naughton’s presentation, which was excellent, is on YouTube, so somebody taped it. The one I saw already had over 6000 views. 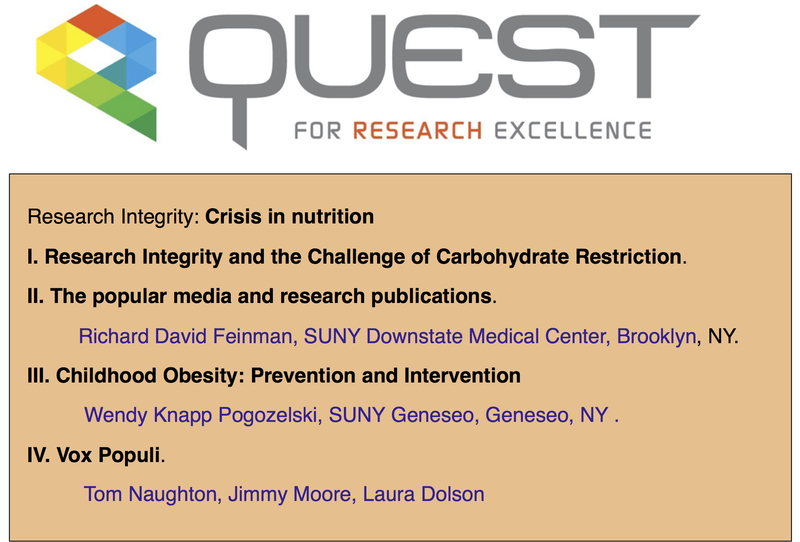 There is a summary of the conference here: http://ori.hhs.gov/blog/quest-research-excellence-2012-summary , and you can leave a comment – which would be good to do, considering the extraordinarily adverse repercussions of the nutrition misinformation that is continually perpetuated as based on good science. If you are on Twitter you can also follow them there and comment, I presume. The ORI is primarily interested in blatant fraud, falsification of data, etc. although one of the speakers raised the question as to whether we should not be concerned with lesser transgressions and their effects. A comment along those lines might be useful to them. Also, they did tape a panel session that I participated in so that may be out soon. Saturated Fat. On your Plate or in your Blood?